Welcome to Indradyumna Swami Diary page! To travel with Indradyumna Swami or to know where He is right now, visit www.travelingmonk.com! In order to go on Parikrama with him during Kartik, visit www.indradyumnaswamiparikrama.com! A full schedule of parikrama for 2017 is now available, find it here. To register, click here. village of every country in the world, my [Krsna’s] name will be sung. every effort to fulfill even till today. Airport, six hours later, to meet the devotees who awaited me there. Through the Diary we can all participate in a most wonderful festival, a festival of association and love. great souls now decorating this world, whose hearts are fixed at Lord Caitanya's lotus feet. by His Holiness Indradyumna Maharaja and his devotees through the pages of this wonderful book. on taking Krsna consciousness to the nondevotee world, especially in the form of Krsna’s holy names. The Swami is not an armchair prophet, sitting in a cozy office issuing dictums to preachers on the field. preaching, the taste of the holy name, and the blessings of guru and Gauranga. narration of his traveling exploit, I feel I am there with him – or rather that I should be there with him. celebrations most people will have – partying and drinking, oblivious to the passing of time. the life of a dear God brother, Indradyumna Maharaja. for all beings is night for the introspective sage. Maharaja’s deep commitment to seeing his Polish festival go on in spite of frightening opposition. bright future for Indradyumna Maharaja, one that should give us all hope. We pray that this world may be blessed with his presence for many more New Year’s Eves to come. I know it is pride to think oneself more fortunate than others, but I get to read Indradyumna Maharaja’s diary chapters before the rest of the world. How could I not feel lucky? I even get to discuss the diary with Maharaja. It’s like having a front-row seat in a class about Srila Prabhupada’s mission. It is all there in Indradyumna Maharaja’s life and diary. “Chant Hare Krishna, “ Srila Prabhupada says, “and your life will be sublime.” Chanting Hare Krishna, of course, is the focus of Indradyumna Maharaja’s life, both as an individual – sitting in the temple, getting out of bed, riding in airplanes and cars – and as a sankirtan leader, taking chanting parties out to advertise an upcoming festival. You can read about an eleven-year-old girl who covered her ears to block the sound but ended up putting on a makeshift sari and running to join the Harinama. And there’s the part about the seal in the Baltic Sea who swam along the beach following the Harinam party. Yet Srila Prabhupada warns us that we may also face danger: “By following His footsteps, you can approach Nityananda Prabhu. Nityananda Prabhu approached Jagai and Madhai at the risk of being personally injured and still He definitely delivered them. The world is full of Jagais and Madhais, namely drunkards, women-hunters, meat eaters and gamblers, and we will have to approach them at the risk of insult, injury and similar other rewards. To face such reverse conditions of life and to suffer thereby the results of actions is considered as the greatest penance and austerity in the matter of spiritual advancement of life. Take risks? Maharaja’s diary reads like an adventure movie; being attacked by skinheads and fanatical Muslims, being robbed by corrupt immigration officials, escaping from a dishonest taxi driver in the dead of night on a deserted street – all for the sake of giving Lord Krishna’s name to the unfortunate souls. It’s too bad we cannot hear Maharaja’s beautiful kirtans just by reading his diary, but anyone who has heard his playin and singing knows that he follows this teaching to perfection, not to mention the dazzling stage shows; dance groups, martial arts, a reggae band, vedic weddings and plays based on vedic scripture. The Plays, though, are only one aspect of scripture in Maharaja’s life. Diary of a Travelling Preacher gives us a glimpse into the mind of someone who knows the books of Srila Prabhupada and the previous acharyas. What is amazing is to read how Indradyumna Maharaja always manages to let himself be guided by just the right verse at the right time. Here is a lesson we can all enjoy. Again, Maharaja sets the example, first as an individual. Everywhere he goes – on a plane on the street – he has a book handy to give to someone, and always with a smooth presentation. And as a leader? You can read about the guests going to the book table at his festivals. And finally, here is something close to every deveotee’s heart; Prasadam. You will smile when you read about the restaurants in one town throwing away tons of meat after the visitors at the Woodstock Festival all went to eat at Indradyumna Maharaja’s prasadam tent. And there’s more. You will go with Maharaja into the underground temple of salt and the temple of fire, share his heartbreak when his friend Sri Prahlada falls sick and has to stop travelling, and – don’t miss this one – stand with Maharaja on the chariot in Puri as he looks into the big, round eyes of Lord Jagannatha. Well? Did I leave anything out? No problem. If I forgot it, you will still find it in Diary of a Travelling Preacher. I got the first peek, but don’t let that keep you away. Everyone gets a front-row seat to watch Srila Prabhupada’s teachings in action. Welcome to Diary of a Travelling Preacher. the same: take this holy name and chant. gifts of rare and exotic Deities of the Lord from ancient and forgotten tirthas. service of guru and Gauranga. Dive deep into Diary of a Traveling Preacher, Volume 8. Late in 1970, on the way to harinama in downtown Detroit, I struck up a conversation with the new devotee sitting next to me in the sankirtana van. It was to the Bhakta Brian’s first experience on harinama, so I explained a little about what was going to happen. A few hours later on our return to the temple, I again found myself seated next to Brian who looked radiant and excited. “So how did you like it?’ I asked. What has proved to be even more remarkable is that Bhakta Brian (now Indradyumna Swami) went on to do just that. Day after day, month after month, year after year for nearly four decades, Indradyumna Swami has remained fixed in doing what he loves most and does best; spreading the glories of the Holy Name far and wide. In this diary series he shares his preaching adventures with us. As an experienced general in Sri Chaitanya Mahaprabhu’s sankirtana army, he takes us out to the front lines and demonstrates his easy strategy for infiltrating Kali-yuga’s camp through expertly choreographed chanting and dancing. Deftly maneuvering his transcendental troops, he knows how to surround the citadels of maya with a gigantic Vaikuntha bubble, vibrant with color, beauty, music, song, and dance. Instantly, people are disarmed by the sincere affection and warmth penetrating deep into their hearts. Transported, people surrender with amazement and happiness to the joyful experience of Krsna Consciousness. This is the simple formula Maharaja sticks to, which as he shows us, works everywhere. From the snow-capped mountains of Siberia to the jungles of the Amazon and along the Baltic seacoast, anyone can receive the Holy Name with appreciation when it is presented with genuine affection by a sincere preacher. Times have not changed. People everywhere are suffering in material existence, and they can be awakened from their mundane slumbler only by the mercy of a devotee. Maharaja shows us that there is no greater joy in this world than waking up sleeping jivas – and no greater adventure. This is what he lives for, and this way he is such a happy and successful devotee. I have personally witnessed the amazing effectiveness of his preaching strategy while traveling with his festival tour along the Baltic coast, and it never fails to bring tears to my eyes. Herein Maharaja reveals his formula for success. And there are so many more wonderful lessons to be gleaned from his diaries. Surely these books should be regarded as extremely important and valuable bhakti literature from which generation after generation of devotees will derive deep inspiration and wisdom. These are the real-life stories of Krsna consciousness in practice. One thing that Maharaja doesn’t often convey in his books, because of his humility, is just how difficult it is to stay out on the front lines preaching year after year. Maharaja has an incredible talent for making the most difficult task of pushing back the forces of Kali look easy and exciting, even like fun. But we should know and appreciate that what he does with apparent ease and joy actually requires immense spiritual strength, focused determination, hard work, and special empowerment from the Lord and Srila Prahupada. For his wonderful example, we own him a great debt of gratitude. Maharaja’s enthusiasm for helping people and sharing Krsna consciousness is infectious. You cannot read his books or be around him without starting to feel that you should also join in and do something to get in on the nectar. I suspect this is one of his motives for writing his diaries: to entice us, to beckon those of us living in our comfort zones to wake up and join him in the sankirtana mission – to take the risk, to push and boundaries, and to experience firsthand the nectar for which we are always anxious. How fortunate we are that Maharaja has taken time from his busy schedule to open his heart to us, to share viral lessons, to enthuse us, to increase our faith, to give us hope, and to show us that new chapters of the modern day Caitanya Caritamrita are being written every day. It is comforting to know that the flame of love brought into this world by Sri Caitanya Mahaprabhu continues to burn brightly in many quarters, especially in the preaching activities of Indradyumna Swami. I hope that devotees all over the world will take full advantage of the mine of transcendental gems offered in the pages of these diaries. We cannot thank him enough for sharing his wisdom and experience, but we can at least try to show our gratitude by supporting him in whatever way we are able: through reading these books, sharing them with others, giving financial aid to his preaching projects, joining him on his adventures, or going out to have some sankirtana adventures of our own. Just as I had that thought, a section of Brihad-Bhagavatamrita came to mind. Gopa-Kumara had just heard the life story of his new disciple, a Brahmin from Mathura. In other words, the Brahmin had no idea what he was doing. He needed guidance. He then begged Gopa-kumara to be his guru and deliver him. Srila Sanatana Goswami, in his commentary on this section of verses, remarks, “of all forms of evidence for establishing the truth, experience from one’s own life is the strongest.” For this reason Gopa-kumara concluded that to tell his own story was the best way to clear his new disciple’s doubts and persuade him to take up nama-sankirtan as the only means of clearing his confusion and reaching his goal. 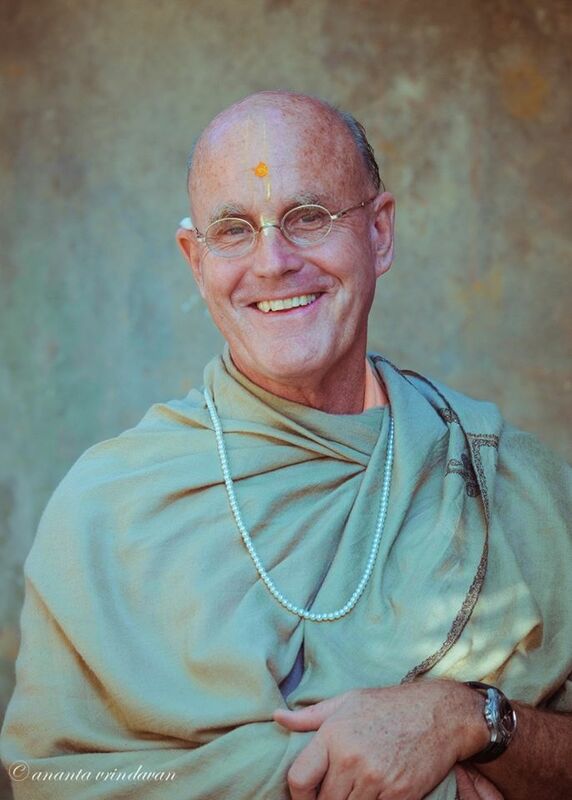 The point I’m making here is that Indradyumna Swami’s publishing of a journal –samples of personal experience he has had as a world preacher of Krishna consciousness – not only is authorized by revealed scripture but also is said to be the most powerful way to inspire others to take up Kanea consciousness and advance in spiritual life. All of us who have conducted public programs as preachers of Krishna conscious can testify that the question “how did you come to Krishna Consciousness” often comes up. And my experience is that just as often the answer to that question is the audience’s favorite part of the lecture. Gopa-kumara’s conclusion, that his disciple must adopt nama-sankirtan sweetly singing the Supreme Lord’s holy names, as the only method for achieving love of God, also applies perfectly to Diary of a Travelling Monk, for Indradyumna Swami’s entire life in Krishna Consciousness has been dedicated to distributing the Hare Krishna Maha Mantra. By nature Indradyumna Swami is an adventurer: and his life in Krishna consciousness has always been a perfect dovetailing of that adventuresome spirit. His diaries, then, are potent means of delivering his steady, contagious enthusiasm for chanting the holy names of the Lord in public. In fact, everywhere Maharaja goes the attendance at programs and festivals increases exponentially, and year after year, as he returns to those same places, more of those attendees go on to become full-time devotees. May this powerful medium, Diary of a Travelling Monk, Maharaja’s personal encounters as a worldwide preacher, travel behind him and continue to increase the number of enthusiastic chanters everywhere.